Niushou Hill (means Ox Head Hill) is south of the city of Nanjing about 10 miles and is surrounded by farmland. In either 766 or 774, during the Tang dynasty, the Monk Farong at the order of the Tang emperor, Daizong, built a large pagoda complex here. This pagoda was historically important as Farong established his own sect of Buddhism here, called the Niutou (Ox Head) sect. 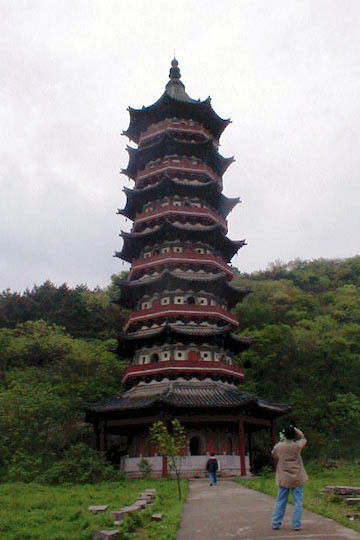 The temple was called Hongjuesi and it included a seven-story pagoda. The temple is long gone, but the pagoda, which was built primarily of brick, still survives and was renovated in the 1990’s. The pagoda is octagonal on the inside and the stairs have been rebuilt so it is possible to climb to the top floor for an excellent view of the surrounding countryside if the air is clear.